Instead of lugging your recyclables outside for collection this week, why not rummage through to gather materials for this unique hanging planter project? 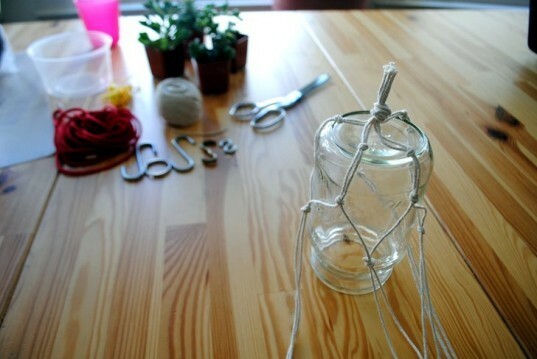 For this fun DIY decoration, you'll use string to knot a custom plant holder for a recycled container. Jam jars, plastic takeout containers, and yogurt cups can all be repurposed into a modern and functional hanging planter. 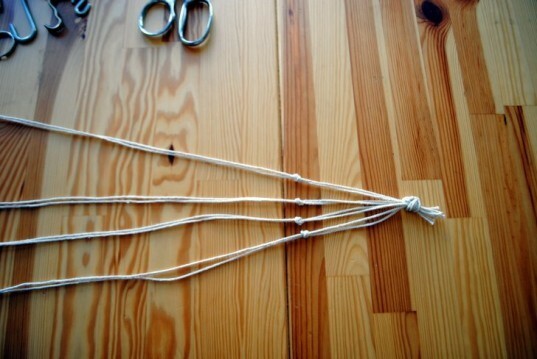 Cut twine or string into 8 equal lengths of approximately 24-34 inches (depending on how large your container is). Knot the ends. Lay out the string on a flat surface and divide the 8 strings into 4 pairs. Knot each pair approximately 3 inches from the base. Take the two ends (left and right) and knot them as well to complete the circle. Keep creating a row of knots by repeating this step 2-4 inches above your first row of knot (depending on how wide your container is – wider containers will require a larger space). Do this by knotting together two strings from alternating rows so that your second row of knots consists of the opposite pair of strings (see picture). Remember to take the two spare ends and knot them together after each row to complete the circle. Test the size of your knotted plant hanger by draping it over your container. Then you can either add additional knots or finish the plant holder. Plant your succulent, vine, cactus, or other plant. Start by adding a layer of sand and/or pebbles to the bottom of the container. This will promote healthy drainage for your plant since these containers do not have an open bottom. 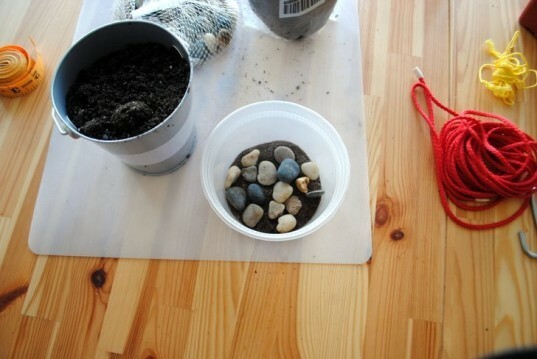 Cover the pebbles with a layer of potting soil and gently add your plant. Gently pull your new knotted string plant hanger up over your recycled container. The final step is knotting all 8 strands together at the top for hanging. Add a hook to hang from a window, shelf, or the ceiling. Variations: You can adapt this plant holder method as creatively as you like. Try a large plant container. Try a tiny plant container. Try a rock or other natural object. Instead of lugging your recyclables outside for collection this week, why not rummage through to gather materials for this unique hanging planter project? 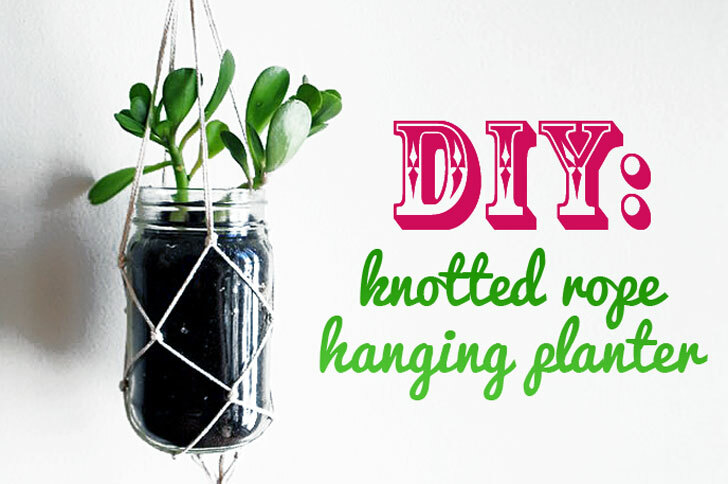 For this fun DIY decoration, you'll use string to knot a custom plant holder for a recycled container. Step 2: Cut twine Cut twine or string into 8 equal lengths of approximately 24-34 inches (depending on how large your container is). Knot the ends. 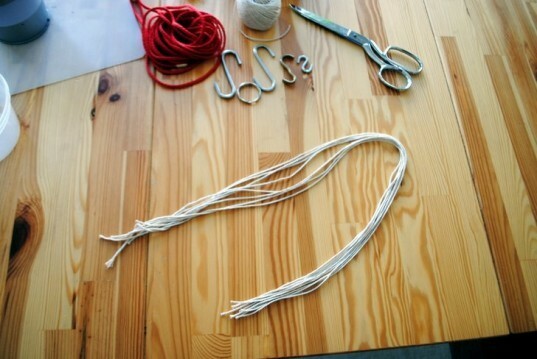 Step 3: Start knotting Lay out the string on a flat surface and divide the 8 strings into 4 pairs. Knot each pair approximately 3 inches from the base. Take the two ends (left and right) and knot them as well to complete the circle. Keep creating a row of knots by repeating this step 2-4 inches above your first row of knot (depending on how wide your container is - wider containers will require a larger space). 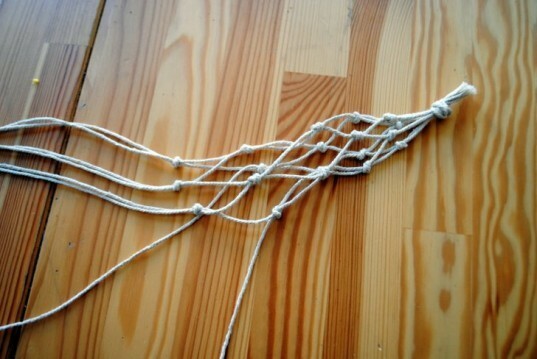 Do this by knotting together two strings from alternating rows so that your second row of knots consists of the opposite pair of strings (see picture). Remember to take the two spare ends and knot them together after each row to complete the circle. Step 5: Test the size Test the size of your knotted plant hanger by draping it over your container. Then you can either add additional knots or finish the plant holder. Check knot spacing on each different container you try. 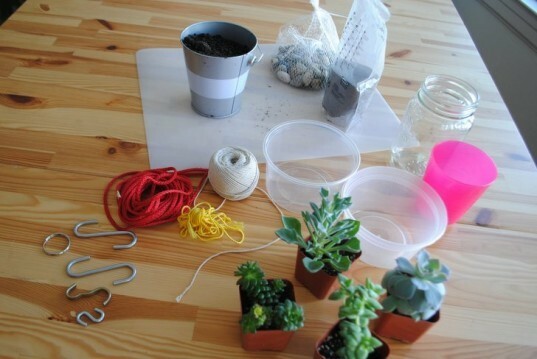 Step 6: Planting Plant your succulent, vine, cactus, or other plant. Start by adding a layer of sand and/or pebbles to the bottom of the container. This will promote healthy drainage for your plant since these containers do not have an open bottom. Cover the pebbles with a layer of potting soil. Gently add a plant to the soil and tamp down into the container. 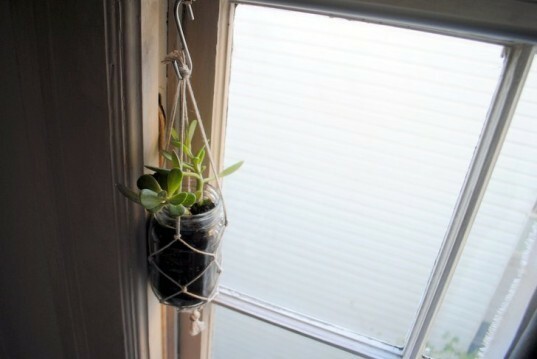 Step 7: Hang your planter Gently pull your new knotted string plant hanger up over your recycled container. The final step is knotting all 8 strands together at the top for hanging. Add a hook to hang from a window, shelf, or the ceiling. Variations: You can adapt this plant holder method as creatively as you like. Try a tiny plant container! Try a large plant container! Try making a holder for a rock or other natural object! Or keep it old school!